With computer usage constantly on the rise, and with over 91% of personal and business PCs using the Windows operating system, knowing the most time-saving keyboard shortcuts and how to use them effectively can speed up your access to information, improve your online experience, and even give you the edge at work. We've compiled a list of our favorite shortcuts and when to use them. Your fingers will thank us later. If you've been using a PC for any reasonable amount of time, you probably already know this. 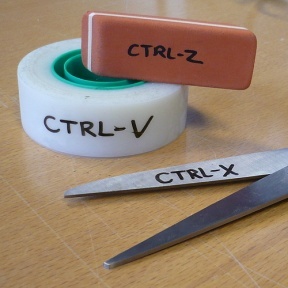 So for you beginners out there - this is the most useful keyboard shortcut you'll ever learn. To copy some text, a website address, or even a file on your computer, simply highlight it with your mouse and hit CTRL+C. If you want to cut it, meaning copy it elsewhere and have it deleted from the original location, hit CTRL+X instead. To paste, place your mouse's cursor on the place where you want the copied data to go, and hit CTRL+V. Although you can easily do the same with your mouse, getting into the habit of using the Escape key to cancel tasks or close dialogs you're not interested in (or that pop up sometimes, especially when browsing the web) will save you tons of time, and, more importantly, help keep your train of thought. Gone are the days of the click-wars with those irritating popups, at the end of which you've usually forgotten whatever it was you were doing in the first place.